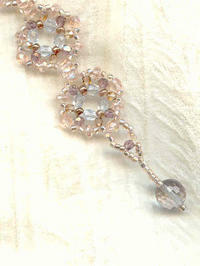 Tiny 3mm and 4mm Czech firepolish crystals are woven into a half-dozen motifs in this intricate pastel sparkler. The (approximately) 7-1/2" long bracelet also features sparkling pale pink seed beads and a disco cut (128 facet) pale lavender crystal 10mm bead as part of the clasp. As delicate looking as lace, it doesn't weigh that much more, either. It's another lightweight lovely from SPARKLE PLENTY. 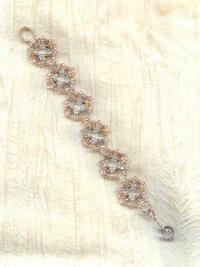 Six ruffly circles of seed beads and Czech firepolish crystal are stitched together to make this 7-3/4" bracelet.